Klipsch KMC 3 review | What Hi-Fi? Klipsch is aiming high with its first-ever Bluetooth speaker, boasting aptX coding technology for higher-quality Bluetooth streaming. It’s portable as well, and with USB charging, a 3.5mm input and a playlist-creating app, Klipsch delivers all the essentials for a Bluetooth wireless speaker. Moreover, the KMC 3 is named after the outdoors Klipsch Music Center venue in Indiana, and the American hi-fi company promises to deliver the atmosphere of live music from the KMC 3. Switch on the KMC 3 and it’s clear that Klipsch has tuned the speaker to give the full vibe of a live concert. The sound is big and loud; it easily filled up our listening room – and we were barely halfway up the volume bar. Turn the volume up higher, and you’ll feel the power driving along the big and beefy notes. Go beyond that first impression of scale, however, and you’ll find that the overall sound is thick and boomy. Instruments lack organisation and clarity, and vocals are unsubtle and sound as if the musicians are simply shouting into a microphone. The KMC 3 makes every song sound as if it’s being performed live and loud and, as a result, it doesn’t deliver a faithful representation of the actual track. All the subtle nuances of Adele’s power vocals in Someone Like You are lost in a cloudy, boomy haze, and piano notes clunk along heavily where they should be agile and emotional. It may sound rich and resonate pleasantly with crisp top notes, but rivals such as the JBL OnBeat Rumble and Libratone Zipp offer a cleaner, subtler sound, and a far more open soundstage. While its low-frequency performance has plenty of depth and impact, the Klipsch lacks the taut agility of JBL’s more precise basslines. Switch to playing via the 3.5mm input, and the Klipsch immediately loses that boomy effect, sounding clearer and much more composed. It no longer feels like the music is being shouted at you, and there’s more depth and detail delivered. It’s a shame there are no EQ or sound settings to fine tune the sound, but as it stands, we’d prefer to play our music through the KMC 3’s wired connection for the more-natural sound quality – which surely goes against the whole point of a wireless speaker. On the plus side, the Klipsch KMC 3 is a portable speaker, so you can unleash that large, resonating sound from the confines of four walls and into the great outdoors. On the flip side, it’s a rather large speaker to carry around with ease, and you’ll need eight D-cell batteries to keep the KMC 3 portable. Oh, and your neighbours probably won’t appreciate the loud concert-style character of the KMC 3. This speaker’s large and bulky shape can be awkward to carry around, and we prefer the more compact and sleek shapes of rivals such as the Libratone Zipp and Sony SRS-BTX500 when it comes to going portable with our music. There’s no carrying case included, so you’re limited to lugging the KMC 3 around by the groove cut into the top panel – weighing 3.5kg, it’s quite heavy to carry around in this manner. Build quality is sturdy, though, and the smooth but tough rubber-like finish makes us confident that the KMC 3 will survive the rough outdoor terrain, be it grass or gravel. The speaker is available in either black or white finishes, and when fully charged, its battery can last up to a respectable eight hours when played at maximum volume. We quite like how Klipsch has kept the unit’s controls to a bare minimum. The power, volume and Bluetooth pairing controls are touch-sensitive and glow red and blue when the KMC is turned on. They’re not quite as instinctive to use at first, and don’t feel as swift to respond when you touch the controls. The volume level indicator pulses up and down gradually as you change the volume, but it just doesn’t feel as satisfying or tactile compared with using the B&W Z2 or Geneva Model S Wireless DAB+’s similar, but more responsive, touch-sensitive controls. The supplied remote control has physical buttons that might feel a bit more comfortable to use, but the small and plasticky remote can’t hold a candle to the more instinctive controls of your smartphone or tablet’s music app when streaming. While there’s no dedicated app for the KMC 3, you can use the KlipschCast section of the free KlipschAir app to create your own playlist, and let friends add songs, too. It’s a slick app and easy to use, with album artwork showing up large and clear even when in list form. That said, since the app is largely devoted to setting up Klipsch’s AirPlay speakers, the playlist feature is the only part relevant to the KMC 3. It’s useful if you want to create playlists on the spot, but we suspect your smartphone’s music app will be preferable for streaming your songs. We can think of rivals – from JBL, Libratone, Geneva, B&W to name a few – that deliver a far more capable and detailed all-round performance, and at similar to more affordable prices than the KMC 3’s £350. 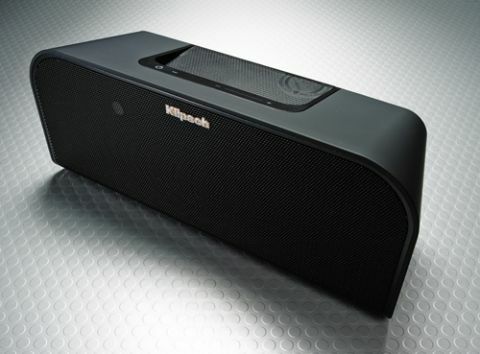 It’s a good effort from Klipsch, but the company has plenty of work ahead if wants to be truly competitive with the leading Bluetooth wireless speakers of its class.